Two goals from Vinny Faherty helped Martin Russell’s men to a long-overdue victory at Markets Field. The Limerick players celebrated with goalscorer Vinny Faherty. LIMERICK PICKED UP their first win of the season in a cracking tie on Shannonside – overcoming Sligo Rovers by three goals to two. Limerick took the lead after 26 minutes when Lee Lynch won possession in midfield. Vinny Faherty timed his run and Lynch found him on the edge of the box. The Galway native still had work to do, but he dropped his shoulder before unleashing a powerful drive to the roof of the net to put Limerick ahead for the first time since returning to the Garryowen venue. 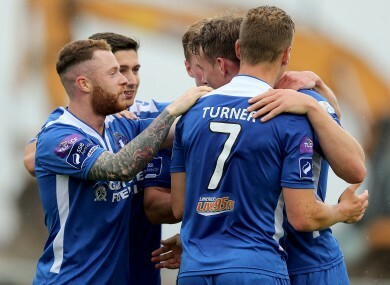 Martin Russell’s men doubled their advantage ten minutes later when Faherty rose highest to head Limerick into their first two goal lead of the season. Ian Turner found space on the right before whipping a well-timed cross into the danger area. Faherty waited at the near post and powered his header past Brush. After Faherty spurned two chances to seal the points, Sligo pulled one back. Former Limerick player Patrick Nzuzi squared a ball across the box from the right flank. New recruit Rob Lehane appeared to get the final touch to put Sligo right back into contention. The home side sealed the points after 67 minutes. Lynch won possession in the Sligo half, before squaring for Vinny Faherty. Faherty then squared for Clarke whose effort took a huge deflection and looped over a helpless Richard Brush in the Sligo goal. Sligo weren’t done there however. Substitute Gary Armstrong pulled a goal back with welve minutes left on the clock when he converted at the back post to provide a nervy finish. LIMERICK: Freddy Hall; Shaun Kelly, Patrick Kanyuka, Robbie Williams, Shane Tracy; Shane Duggan; Ian Turner (Sean Russell, 82), Paul O’Conor, Lee-J Lynch, Dean Clarke; Vinny Faherty (Cyril Guedje, 82). SLIGO ROVERS: Richard Brush; Patrick Nzuzi, Gavin Peers (Gary Armstrong, 46), Tim Clancy, Alan Keane; Jason Hughes, Gary Boylan (Danny Ledwith, 46); Raffaele Cretaro, David Cawley, Regan Donelon (Jake Dykes, 86); Rob Lehane. Email “Limerick finally earn their first league win of the season to pour more misery on Sligo”. Feedback on “Limerick finally earn their first league win of the season to pour more misery on Sligo”.